Alright, alright, alright!!!! 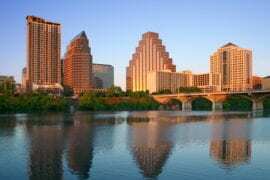 If there’s a hotter city in the United States right now than Austin, Texas, we don’t know what it could be. 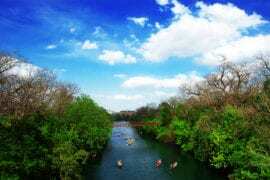 Home to the University of Texas (Hook ’em, Horns! 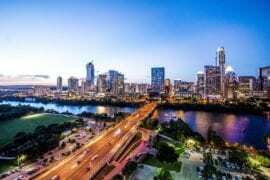 ), Austin has an incredibly active music scene and live concerts and music festivals have become a vital part of life in the city. 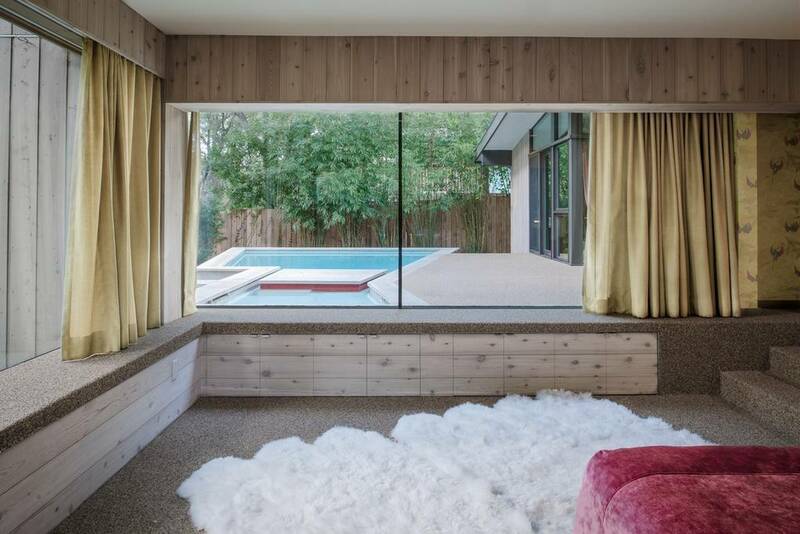 If you’re coming here to take in ACL or SXSW, the Austin Airbnb options are pretty great. Couldn’t get festival tickets? 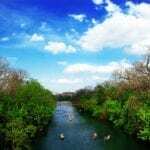 As a center of art, culture, nature and creativity, Austin has something for everyone! Here are some Airbnb Austin recommendations for visitors who want a taste of the luxury Austin has to offer. We guarantee they’ll have you singing a happy tune! While it may seem more like a college than a house, we assure you, it is. 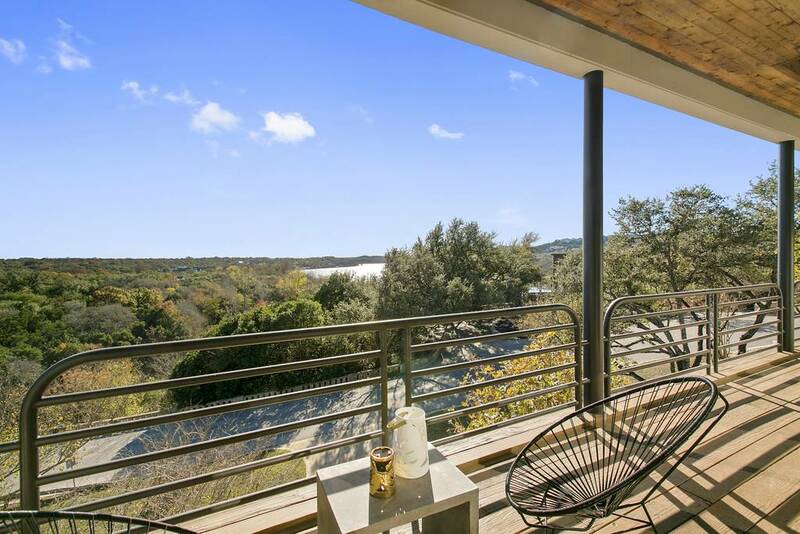 This astounding home on the edge of Lake Austin sleeps eight within its five bedrooms but chances are, with all this Austin Airbnb offers, you’re not going to want to spend your time in bed. 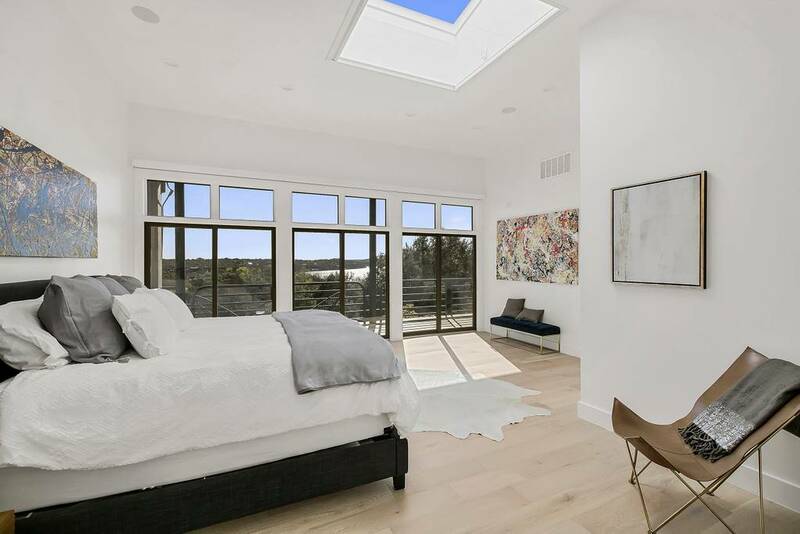 If you do make it up and out, you’ll find that the French doors in your bedroom open up to stunning covered balcony that looks like something on the cover of “Magnolia Journal”. The lower level of the home includes a fireplace, bookshelves that are full of books, and a huge bar area (Super Bowl Party, anyone?). When you’re ready to get a little air, there are two paddle boards, a kayak, and a canoe. 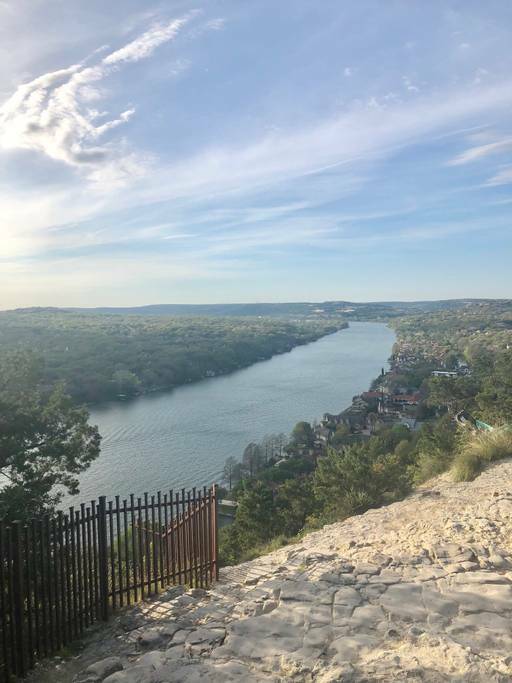 If you do get around to seeing the city, you’ll be only 15 minutes from Austin! 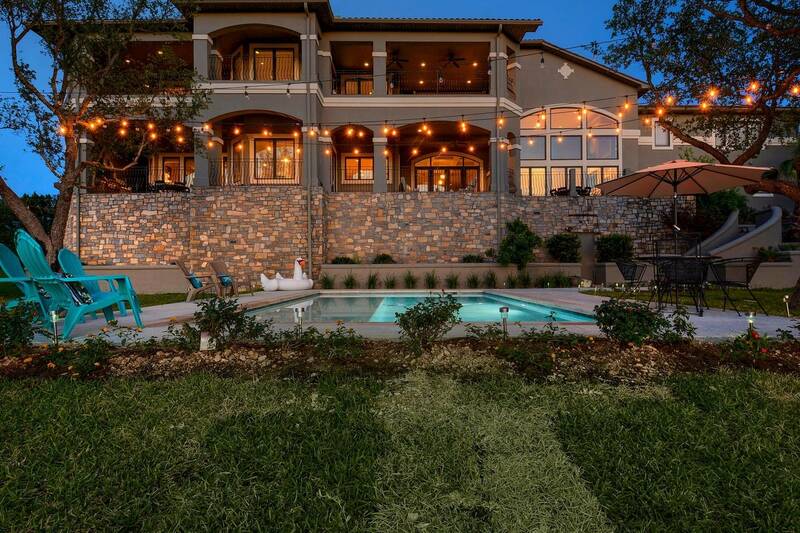 You know you’re in a great place when half the great features of a house are outside. 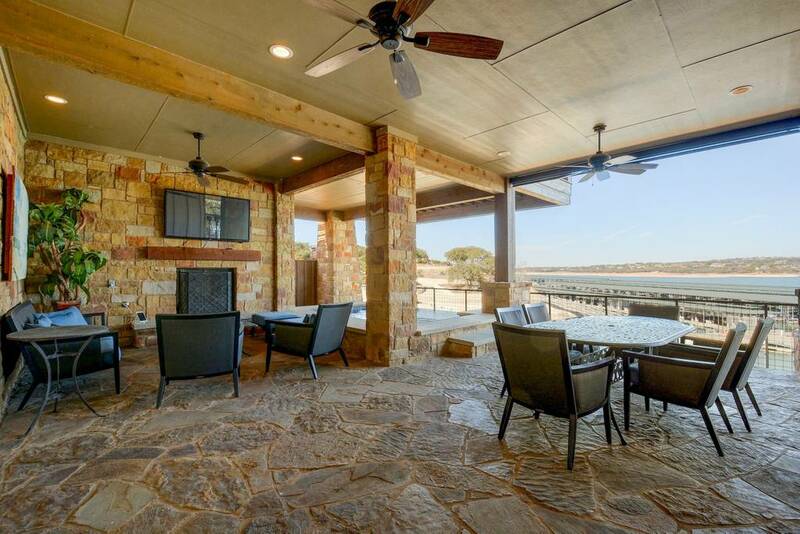 Just to name a few, this house has an amazing pool, a bar area with a wine cooler and ice maker, a bocce ball court, a boat lift for your boat, a boat house, an outdoor firepit, an outdoor kitchen, a three-car garage with outlets for your Tesla, a sauna, and a 40’ deck. Not enough, you say? 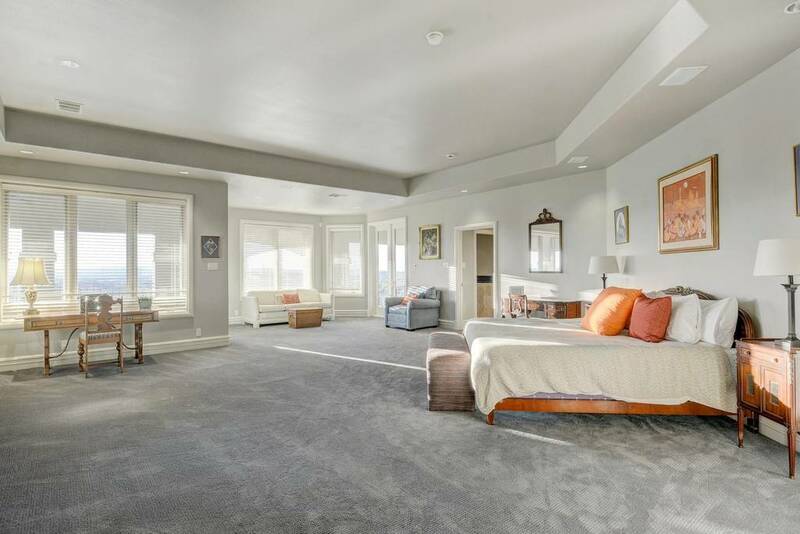 OK, well, the inside sleeps over 16 people, has a Sonos audio system, a dedicated office with printers and scanners, nine smart TVs, a pool table, not-to-be-believed lake views and an elevator. Yes, we said an elevator. The only thing it seems to be missing is a pony, but we’re guessing you could probably bring your own. They don’t call this an “Ultra-Mansion” for nothing! 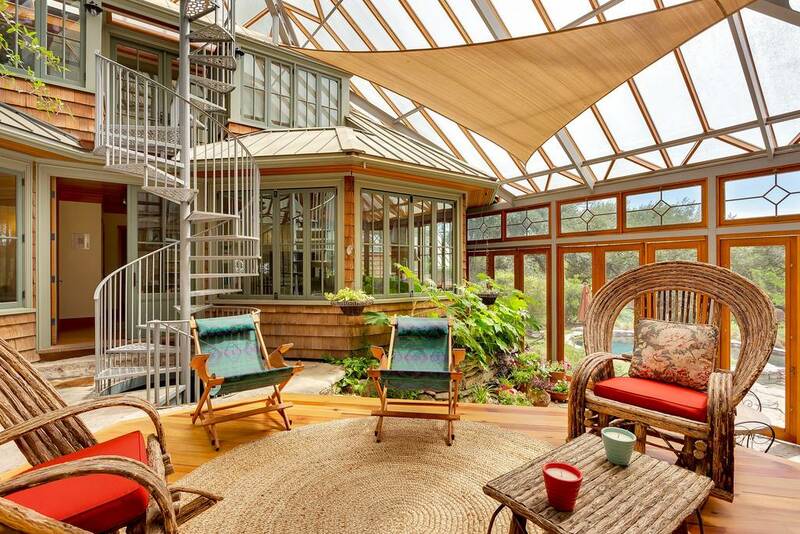 With 7,241 square feet in which to play and a view of the lake that has to be seen to be believed, this off-the-hook house is one of the most impressive Oregon Coast Airbnbs we’ve ever seen. 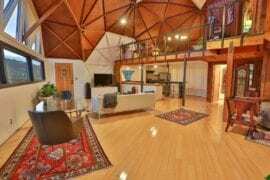 Close to the downtown area, this Airbnb has a gym, a sauna, an “Italian Chef” kitchen, 35-ft. ceilings, and yes, its own elevator. 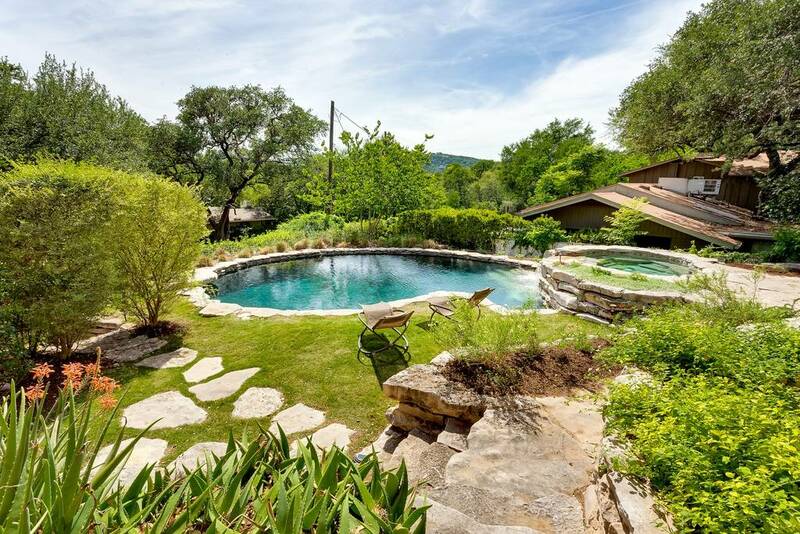 A favorite of celebrities and golfers who often come here to golf, this home is near Mount Bonnell, a great place to hike and watch the sunset. 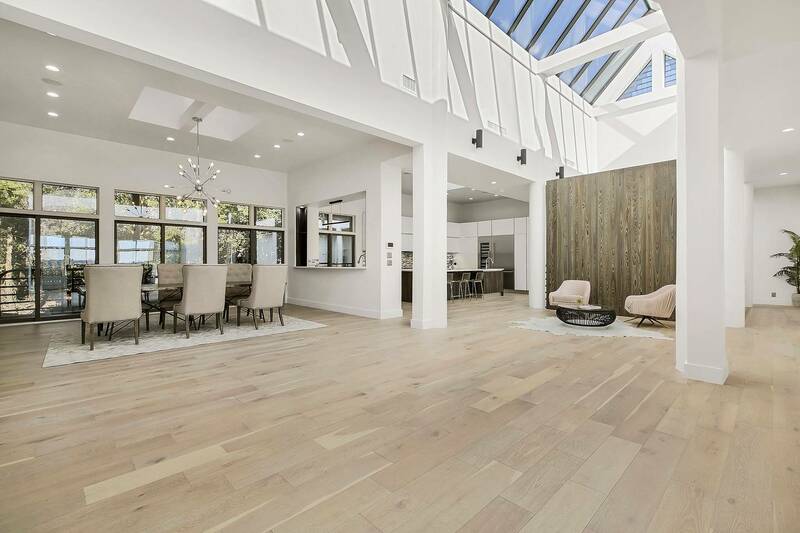 That said, you can probably just watch it from home since this place is so full of skylights! It’s fair to say, this one has us ultra-excited! 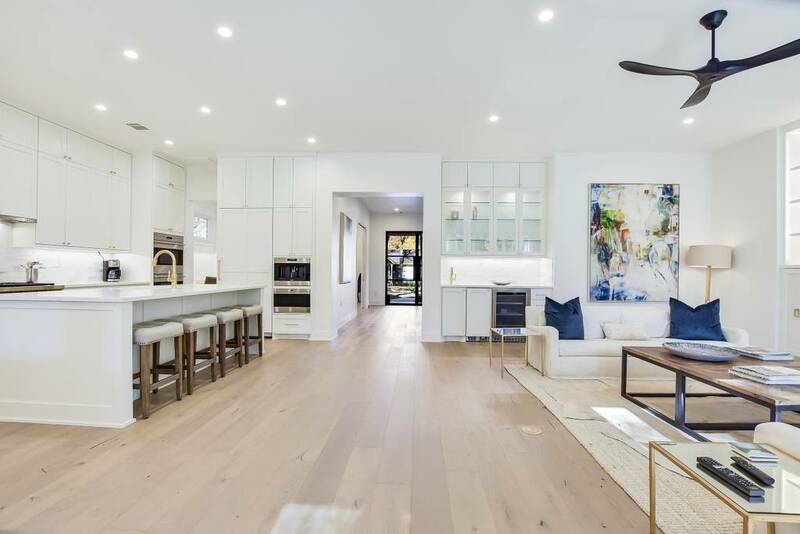 Proving that luxury can also feel homey, this adorable four-bedroom home in Tarrytown is perfect for someone who wants the expanse and conveniences of a luxurious Austin home but wants a lot of warmth. 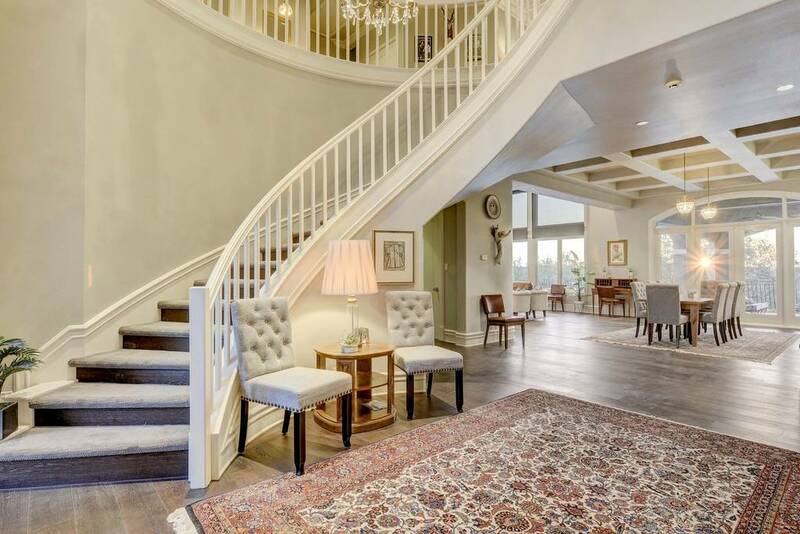 While there is much to enjoy about this four-bedroom, three-and-a-half bath manse, perhaps its star feature is its 900 square foot atrium made of Texas limestone which features a spiral staircase that to a perch that will give you incredible views of the surrounding area. 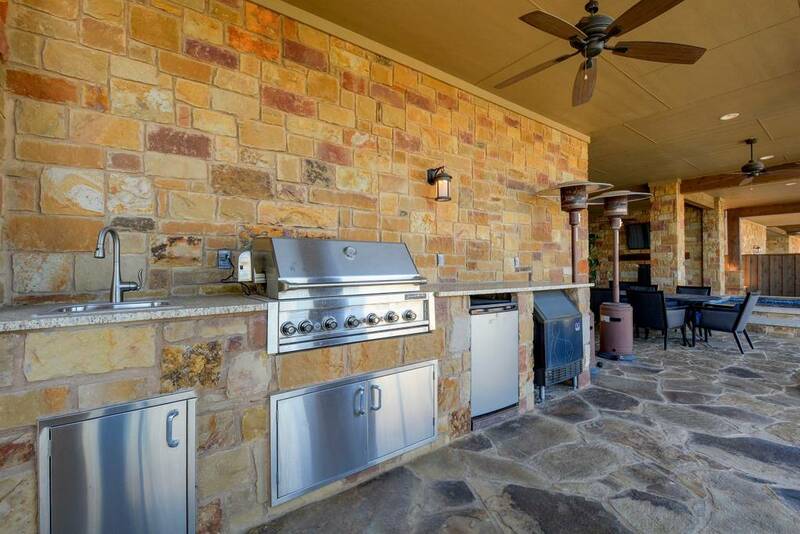 It also has a sitting area and a BBQ, making it great for parties if that Oregon rain has forced you inside. 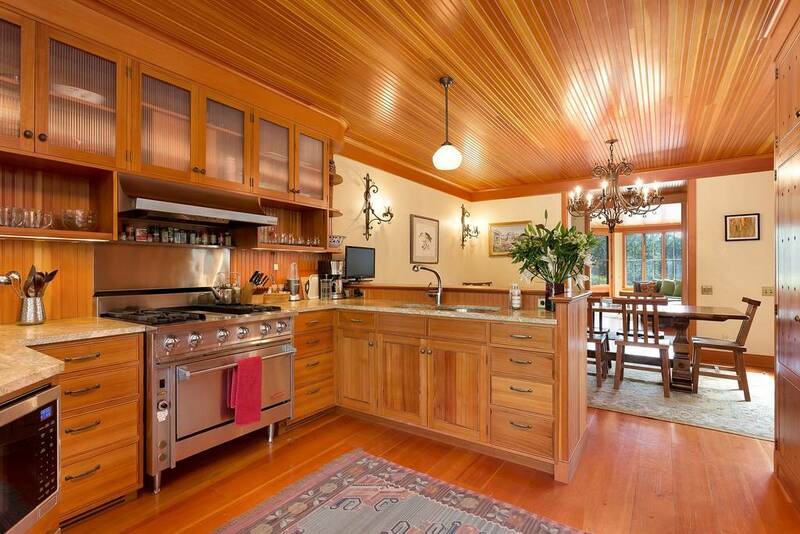 The warm wood of the rest of the house (including that incredible kitchen) offers such a cozy feel, but don’t let that make you miss the saltwater pool and hot tub! 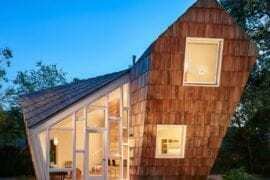 While it may not have its own elevator, this newly renovated, mid-century Oregon Airbnb may be the coolest house on our list. 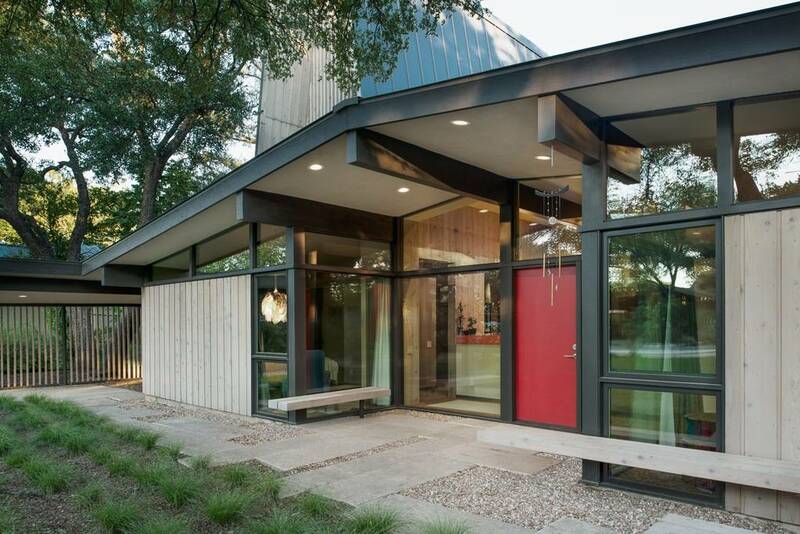 Remodeled by the acclaimed Webber + Studio firm, this aesthetically intriguing 1968 home is one of the most unique places you’ll probably ever stay. Having been featured in several magazines and home tours, this Oregon Airbnb is going to make your Instagram blow up! 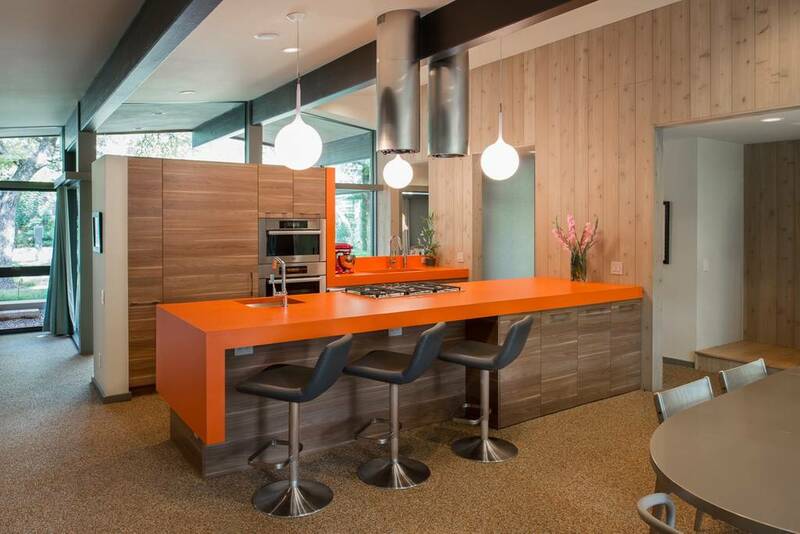 (Seriously, if that Brady Bunch kitchen doesn’t do it, we don’t know what will!) 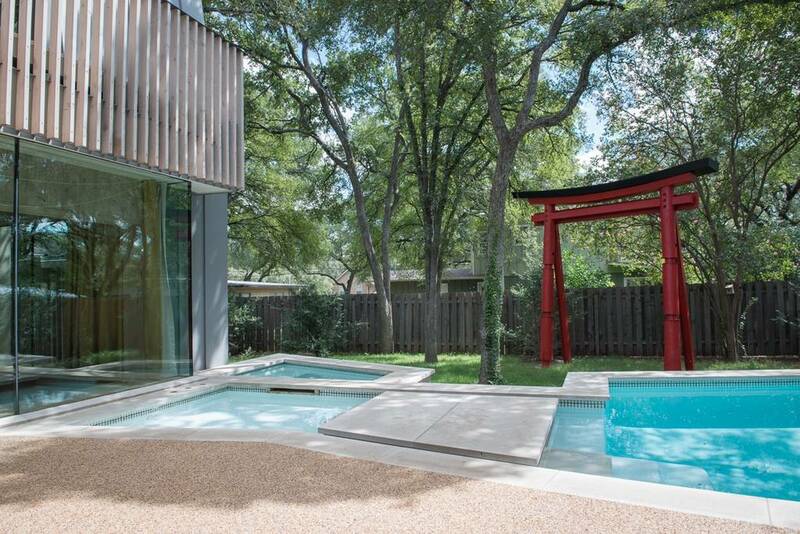 With a gas fireplace, a geometrically shaped pool, and the super-cool, original Torii (Japanese gateway/entry originally located at the entryway of the home) from 1968, you won’t think twice about that missing elevator. 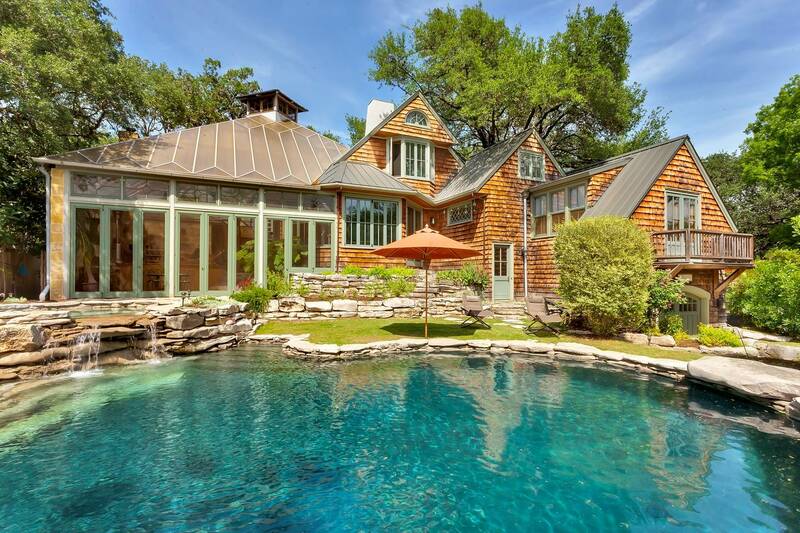 Located in the Westlake Hills area, this home is just a quick drive to downton Austin. When in Rome!!! 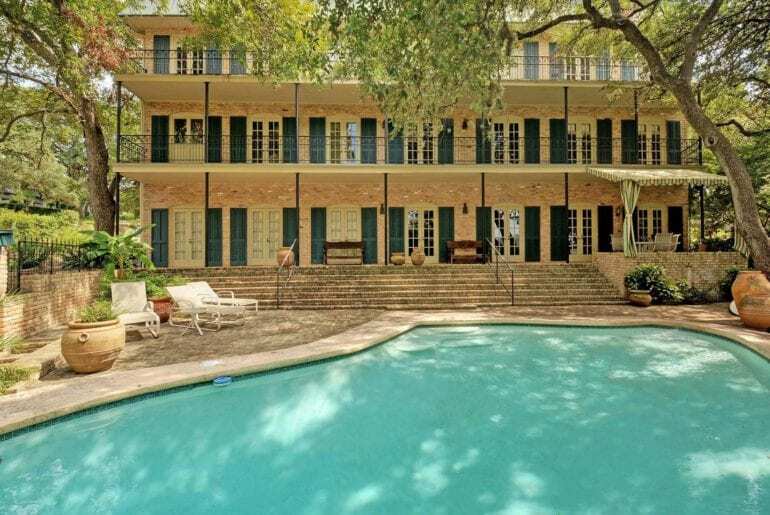 As long as you’re in Texas, why not stay in a place that really makes you feel as if you’re there! 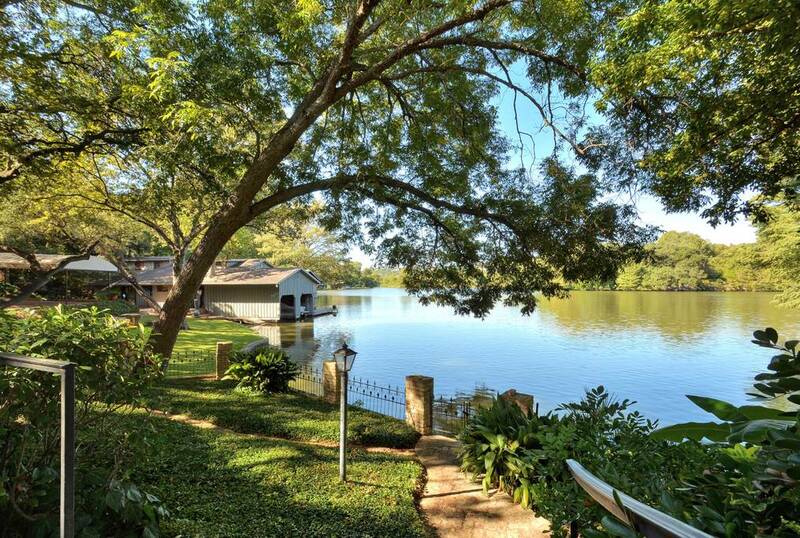 This is the perfect place to do just that! 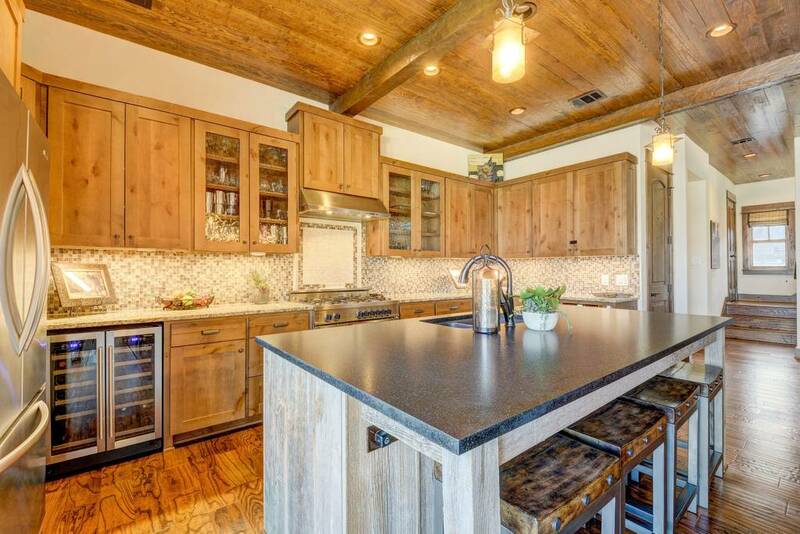 This three-bedroom, five bath rustic retreat sleeps 8 people in three bedrooms and five bathrooms and at $731 that’s a pretty good deal! 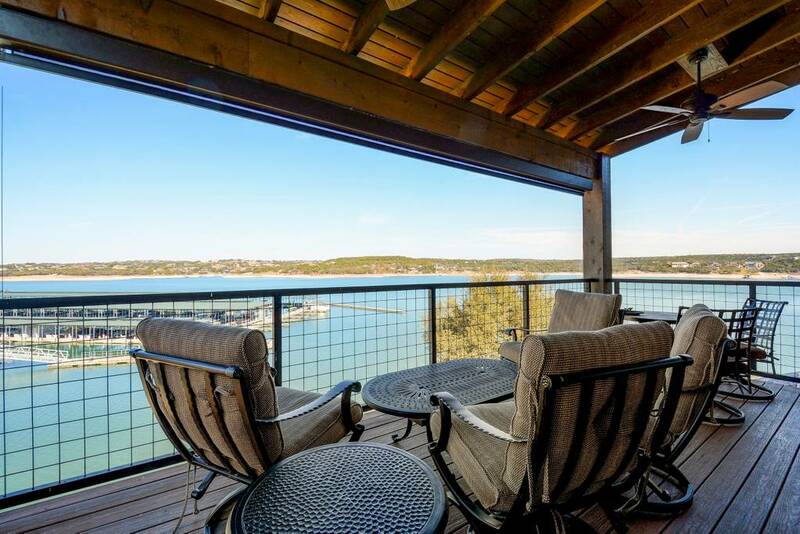 Located in Spicewood, this lovely home overlooks Lake Travis and includes an infinity spa that also overlooks the lake. 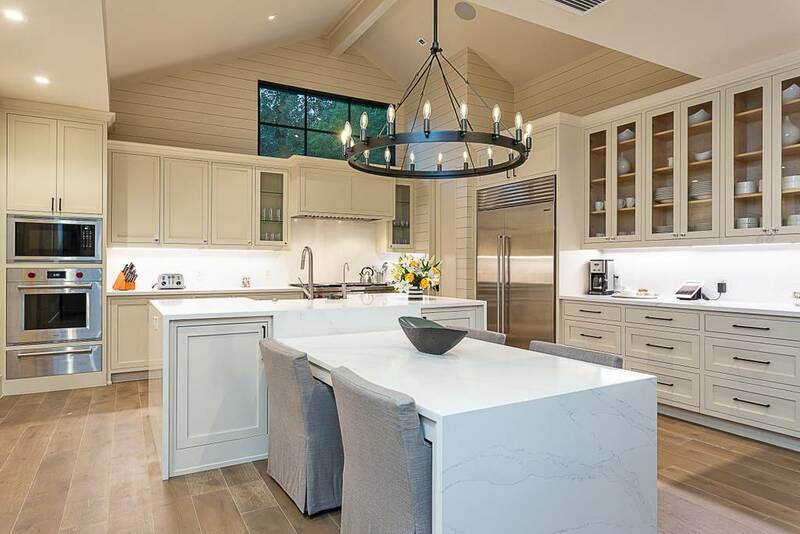 Decorated with a traditional Texan aesthetic (cow hide rugs, longhorn skulls, and deep leather couches abound here), this property includes a gas fireplace, wet bar, and floor-to-ceiling windows. You’ll be in the middle of wine country so after a day of boating or hiking, check out the local vineyards or head to Crystal Creek Moonshine were you can get just about any kind of spirit you’re looking for. 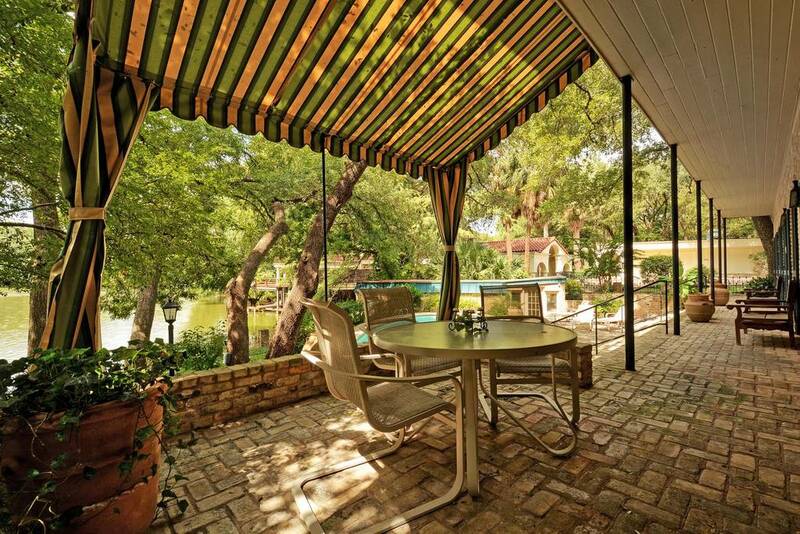 They say everything in bigger in Texas and this Austin Airbnb proves it. This place is big, big, big! 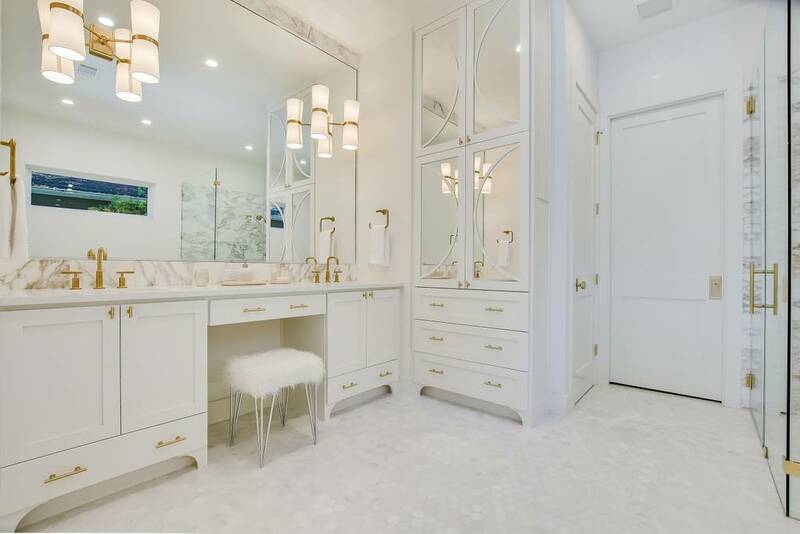 High ceilings, floor-to-ceiling windows, a kitchen the size of a football field, a staircase worthy of Gloria Swanson, a master bedroom big enough for a bunch of pageant contestants to get ready in and a master bath that looks like something out of a “Real Housewives” franchise are all part of this extraordinary Airbnb property. Sleeping more than 16 people (there’s even a room with bunk beds), this would be a perfect place to get together for a family reunion or wedding! 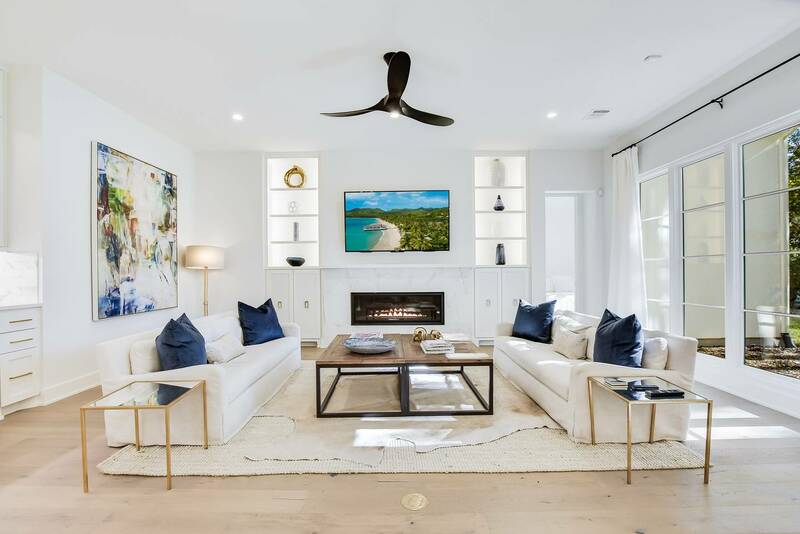 Outfitted with all kinds of toys like a shuffleboard area, a pool room, an actual pool, and loads of outdoor living space, you may never actually get into town! 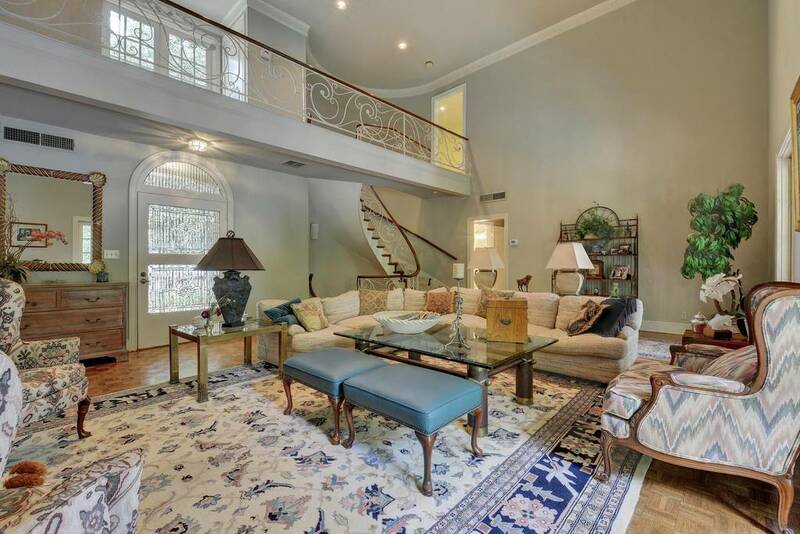 Located in the highly desirable Tarrytown neighborhood, this sophisticated Airbnb offers southern elegance at its finest. 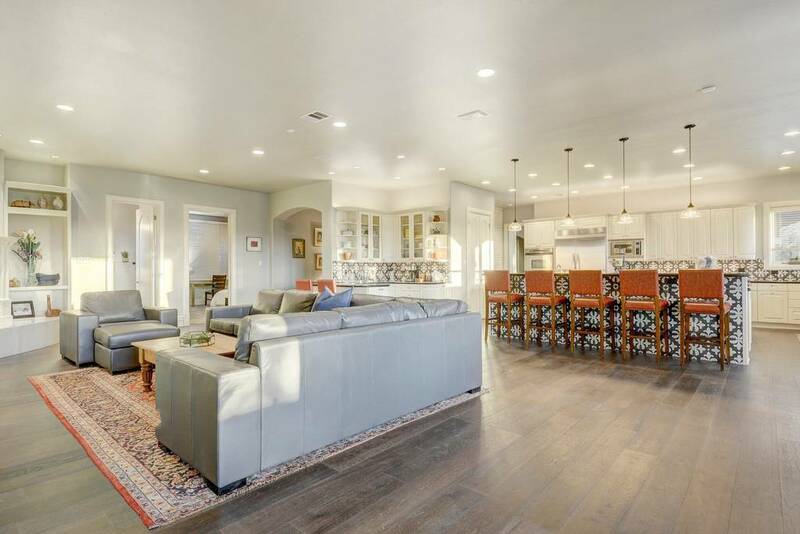 A modern six-bedroom home, this place is perfect if you’ve got a mix of people who like to be both indoors and out. With huge living spaces, flat screen TVs, a great big soaking tub, lovely outdoor sitting area, and even a study, this is the perfect place for the homebodies who like to stay in. 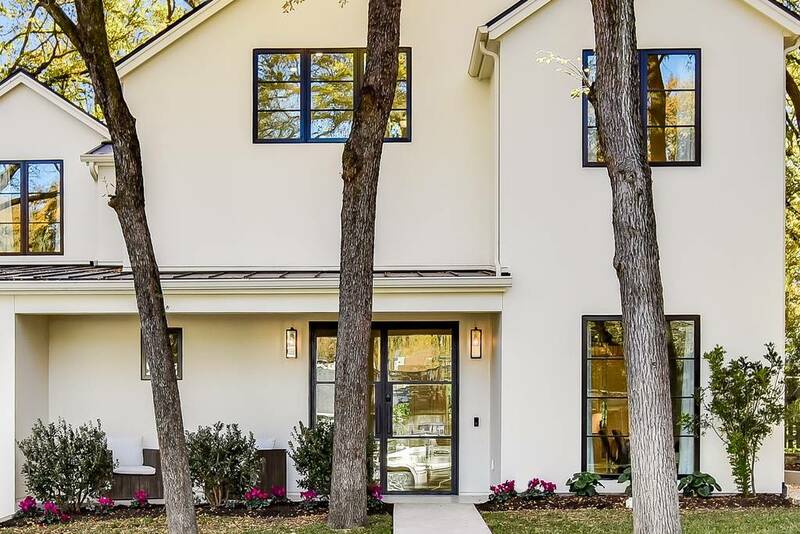 At the same time, it’s less than half a mile away from Lake Austin, a local golf course, Zilker Park and the UT campus for those who prefer to be outside. 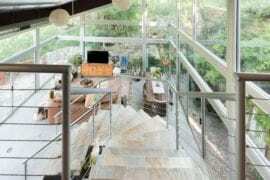 Just make sure you book early as this is a highly desirable property!